This is easily one of the best narrative nonfiction books I have ever read. It tells the story of what happened in one New Orleans hospital during Hurricaine Katrina, where doctors and other medical staff were accused of euthenizing patients. The book is divided into two sections. The first is an account of what happened in the hospital during the storm. The second recounts the legal process in the years afterward. Dr. Anna Pou, a doctor who was working in the hospital during Katrina, and later arrested, is a focal character. The author relies on the viewpoints of many different people to tell a necessarily complicated tale, but she has done an excellent job at weaving all the narrative threads together into one compelling story. 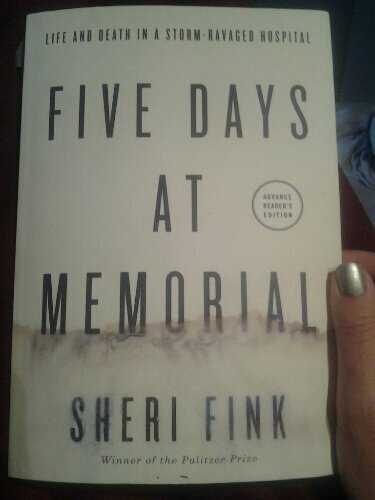 This is a good book but also a sad book. One of the things that astounded me page after page was the poor planning and communication at almost every level of disaster response. For example, most hospitals in New Orleans (including Memorial) had food and water stores as well as generators at or below the ground floor (below sea level.) Another example was the evacuation issue: the mayor ordered people to evacuate, but roads were clogged and not every one had cars. The hospital burecrats (off location) and government officials each assumed the other was responsible for removing hospital patients. Once evacuated, there was no plan in place for which hospitals would take in patients, or how they would get there. And of course no one knew how to prioritize: should the sickest patients leave first, or those with the best chances of surviving? Even in Memorial hospital, it seems that some basic knowledge and communication could have helped. The author clearly portrays the medical professionals who were there (some of whom chose to stay to care for the sick and dying) in a favorable light, as people who did often heroic things under the worst of circumstances. But it seemed that some of the circumstances didn’t have to be. I was particularly upset when I read that another building in the Memorial complex had electricity, but on-site administrators chose to hole up there, rather than bringing patients in where climate control and ventilators could’ve eliminated suffering and saved lives. Sadly, we know what happened. The healthier patients and their families left first, leaving the very sick and terminal patients to suffer in the heat, darkness, and increasingly poor sanitation; without access to basic medical care like oxygen. At some point, at least one doctor made the descision to give these patients large doses of morphine and other drugs. Was the intent to alleviate suffering in patients truly believed to be dying? Or was it, in fact, to cause death in patients that might have lived? A grand jury eventually found Dr. Anna Pou not guilty of murder for her role in administering the drugs. But the bigger issues remain unanswered. What accountability do doctors face in a disaster situation? Who is responsible for crisis response? What should triage be when resources are limited? And of course, what sort of care is acceptable at the end of life- where is the line between palliative care and euthanasia or assisted suicide?? There are no easy answers, and this author avoids the temptation to provide them. She tells a story, and raises the questions, and then the words stick with you long after the book is over. I received an Advance Reader’s Copy for this review. Covers often change before publication, but I hope this one does not, as the design is eye-catching and extremely fitting. You might like: Columbine, Dave Cullen. Zeitoun, Dave Eggers. This entry was posted in Non-Fiction, Top 10 and tagged death, doctors, euthanasia, Katrina, medicine, non fiction. Bookmark the permalink.